The new Cabinet of Prime Minister Shinzo Abe aims to carry out drastic reforms to the nation’s labor and education systems in a bid to wean the country off its “one-track” career tradition as the population rapidly ages, the newly appointed economic revitalization minister said in an interview Wednesday. 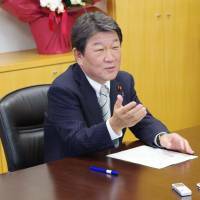 “So far, we all have been on a one-track career of getting an education, graduating from school, getting a job (at one company) and then retiring,” said Toshimitsu Motegi, who was appointed to his post in the Aug. 3 Cabinet reshuffle. “Now, we need to change,” Motegi told a joint interview with media outlets including The Japan Times. The bizarre term has puzzled Japanese social media users, who wondered what the government means by “revolution” and what exactly Motegi has been asked to do. The official English translation of the term “human resources development,” however, is humbler and somewhat easier to grasp. Currently, most major firms hire a number of graduates fresh out of university each spring, while also employing far fewer midcareer workers. This happens against the aforementioned one-track background, where most workers continue with a single company for decades, since Japan’s labor market has less liquidity than many other countries, until their eventual retirement at around 65 years old. But this kind of one-track career system with a specified retirement age is unlikely to work in graying society, Motegi said. “In Japan, 1 in 2 children currently aged 10 are now predicted to live until the age of 107,” Motegi said during the interview. “If you retire at the age of 65, your retirement period would continue for 42 years,” he said, adding that it would be “difficult to expect that such a one-track career” system would then continue to be viable. Meanwhile, domestic firms will have few options other than to hire more midcareer workers as they seek staffers that can adapt to the changing business environment, Motegi said. To facilitate this shift, the government plans to hammer out labor and education reforms to help workers acquire job skills that will let them easily change careers at any stage of their lives, he added. 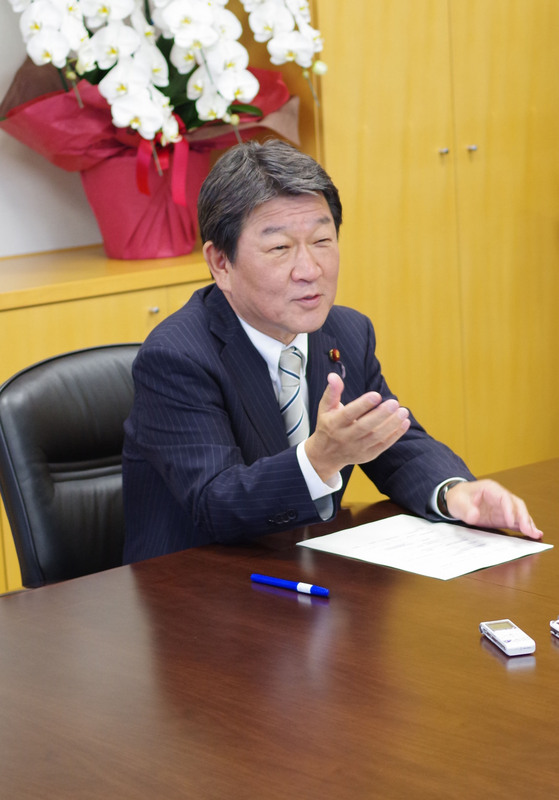 At his first news conference on Aug. 3, Motegi cited several policy ideas to make the education and labor systems more flexible. These ideas included offering cheaper or free higher education and providing options for “recurrent” adult education so that workers can acquire skills and knowledge at any stage of their lives. Others measures under consideration include helping companies bolster the ranks of midcareer employees and making reforms to the social welfare system to provide a safety net for people of all generations working in the more liquid labor market, Motegi said. The government plans to set up an expert panel to discuss details of these measures next month, with a goal of submitting an interim report by the year’s end. After the panel submits a final report around next June, the government will implement measures proposed for “human resources development” over the next three years, he said.